← The Artists Are In Town!! 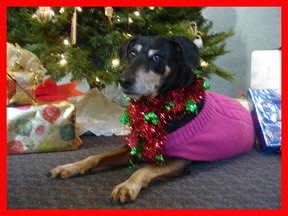 Well, well, well… Happy Tail Wags and wishing you all a good holiday season full of… Yup, you guessed it, TREATS!! We have our annual Holiday Show up at the gallery. This year the show is called Gather ‘Round to inspire all of us to gather round and enjoy each others company and share stories. Anybody bring the treats?? Lots of the gallery artists brought great art for the show plus handmade ornaments for the trees. Be sure to stop by to say hello to me and check out the show! From now until the end of December 2014 the gallery is offering a special to anyone who buys $100 or more! Stop by to learn about saving 10% for those of you who aren’t members of the Sedona Arts Center. Those who are,,,, well you will save an extra 5%! And you get to visit me. What could be better? First Friday was a good time had by all, especially me. I had my jingle bells on and antlers around my ears and I was a party girl extraordinaire. Lots of friends came by and I had to say hello to all plus make a few new friends. Someone (mom) pinned a sign to my antlers telling people not to feed the Reindeer Dog. Awwww, come on, it is the holidays after all. How am I supposed to fatten up for winter? Next Saturday, December 13 is one of my favorite events here. Loving Bowls will happen from Noon – 3 down at the barn. Over 1200 bowls were made by local potters to be sold at $10 each to benefit 4 local charities. One of the businesses getting the help will be the Sedona Humane Society. Come on by. We even made bowls for your favorite 4-legged companion. So, you all have a Happy Holiday season and be sure to stop by the gallery to say hi.